Ankylosing spondylitis (also called Bechterew's disease) is a spondyloarthritis of the spine and pelvis. It is a common chronic inflammatory rheumatic disease with unknown etiology. AS is associated with the HLA-B27 antigen and also with other chronic inflammatory diseases. AS affects the axial skeleton and sacroiliac joints, causing characteristic inflammatory back pain, which can lead to structural and functional impairments and a decrease in quality of life. Affected joints progressively become stiff and sensitive due to a bone formation at the level of the joint capsule and cartilage. It causes a decreased range of motion and gives the spine an appearance similar to bamboo, hence the alternative name "bamboo spine". Although not often recognised, ankylosing spondylitis can also cause peripheral joint pain, particularly in the hips, knees, ankles, and shoulders and neck. It involves synovial and cartilaginous joints, as well as sites of tendon and ligamentous attachment.Early diagnosis and treatment helps to control the pain and stiffness and may reduce or prevent significant deformity. Pain in AS can be caused by sacroiliitis, enthesitis and spondylitis. Initially the sacroiliac joints, situated in the lumbar part of the back, which connect the spine and the pelvis, are damaged. Subsequently the inflammation moves to entheses, where ligaments and tendons integrate into bone. Eventually, the spine is affected by this inflammation. The vertebral column normally exists of 24 vertebrae, joined together by ligaments and separated by intervertebral discs. Patients diagnosed with AS form calcium deposits in the ligaments between and around the intervertebral discs. An accumulation of the deposits leads to ossification , starting from the vertebral rim towards the annulus fibrosis and characterised by syndesmophytes. 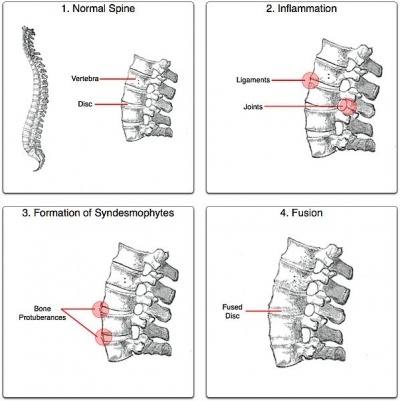 In highly advanced cases, the spine can fuse together as a result of the bone formation. AS Affects 0.1 to 0.2% of the population and  is predominantly seen in males in a 3:1 ratio. The onset of symptoms generally occurs in late adolescent years to early adulthood. The peak age in which AS manifests varies from the teens to the fourth decade of life. Its prevalence is highest among white people (0.1-0.2%), less common in American blacks and rare among Japanese, so there is both a familial and a racial predisposition to this disease. Initially, there is an infiltration of the subchondral bone by granulation tissue which causes small lesions, ultimately leading to joint erosion (the adjacent cartilage is distorted which produces a very irregular surface). These lesions in the annulus eventually undergo ossification, leading to a fusion effect of the spinal segments and the similarity in appearance to bamboo. In the spine this occurs at the junction of the vertebrae and the annular fibres of the intervertebral disc. The clinical presentation is usually an insidious onset of back pain in the sacroiliac (SI) joints and gluteal regions and progresses to involve the entire spine. Morning stiffness lasting greater than 30 minutes is a common subjective complaint, as well as waking up in the second half of the night. Pain and stiffness increase with inactivity and improve with exercise. It may also variably involve peripheral joints, eyes, skin, and the cardiac and intestinal systems. Eye disease occurs in about 25% of the patients as either iridocyclitis or conjunctivitis. Joints other than those of the axial skeleton can be involved with an inflammatory arthritis and synovitis which is seldom as destructive as that of rheumatoid arthritis. The hips, shoulder and knees are the most commonly and most severely affected of the extremity joints. Complaints of intermittent breathing difficulties may also be a common complaint because AS may cause a decrease in chest expansion. C-reactive proteins (CRP): This is also a marker of inflammation and is found in 50-70%  of people with AS. However, this test is discouraged because it is associated with a high rate of false positives due to the fact that high CRP occurs in 10% of the Caucasian population. X-rays are the most useful imaging modality in established the disease, although they may be normal in the early phases. X-ray shows up areas where the bone has been worn away by the condition. The vertebrae of the spine may start to fuse together because the ligaments between them become calcified. MRI scanning may also be useful in identifying early sacroiliitis. 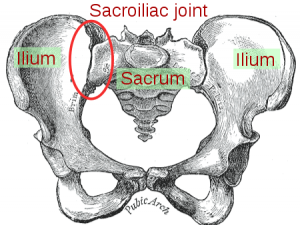 MRI of the sacroiliac joints is more sensitive than either plain X-ray or CT scan in demonstrating sacroiliitis. Sacroiliitis initially shows as blurring in the lower part of the joint, then bony erosions or sclerosis occur and widening or eventual fusion of the joint. 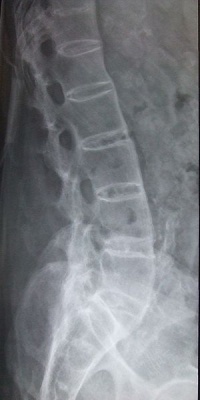 A patient can be classified as having definite AS if at least 1 clinical criterion (inflammatory back pain, limitation of mobility of the lumbar spine, or limitation of chest expansion) plus the radiologic criterion (radiographic sacroiliitis of grade 2 bilaterally or grade 3–4 unilaterally) are fulfilled. may also be appropriate. Laboratory values, such as the CRP, are used to monitor the effectiveness of medication treatments. Video 1: The aim of the Schober test is to assess the mobility of the lumbar spine, which can be abnormal even when it is not obvious to the individual. Video 2: The lumbar spine side flexion test is another test to measure the lumbar spine mobility. Video 3: When ankylosing spondylitis affects the mid-back region, normal chest expansion may be compromised. The aim of the chest expansion test is to assess the thoracic mobility. Video 4: The tragus to wall test is a test to measure the cervical mobility. Non-steroidal anti-inflammatory drugs are primarily used for ankylosing spondylitis (AS) patients to reduce the inflammatory symptoms such as pain and stiffness of the spine and other joints. It is important to remember that NSAIDs do not alter the disease cause and only affects the symptoms. Commonly used NSAIDs for AS are tolmetin, sulindac, naproxen, diclofenac and indomethacin,  which is the most effective. When patients are refractory to NSAIDs, corticosteroid injections may be prescribed or disease modifying anti-rheumatic drugs (DMARDs), including methotrexate and sulfasalazine. However, corticosteroids do not have evidence-based outcomes and DMARDs are only proven to be effective for the treatment of peripheral joint diseases. Research has shown that patients with ankylosing spondylitis have an abundance of pro-inflammatory cytokine tumor necrosis factor (TNF) messenger RNA and proteins in the sacroiliac joints. The use of anti-tumor necrosis factor therapies has therefore proven to be positive. Etanercept and Infliximab have both been used to treat AS patients with successful results. All drugs have side effects, so patients with other health issues need to verify if they are able to take the recommended medicines. Physical therapy is an essential part in the treatment of AS. (LOE:5) It aims to alleviate pain, increase spinal mobility and functional capacity, reduce morning stiffness, correct postural deformities, increase mobility and improve the psychosocial status of the patients. Proper sleeping posture on a solid, flat bed without pillow. Frequent sleeping or lying in prone position. Posture exercises with upper back hyperextension (performed with avoidance of lumbar hyperextension). Breathing exercises to increase or maintain rib cage excursion, as well as instruction in abdominothoracic breathing. Range of motion exercises for hips and knees to prevent flexion limitation and contractures. Periodic rest periods with avoidance of fatigue. Manual mobilisation improves chest expansion, posture and spinal mobility. (LOE:3A) Both active angular and passive mobility exercises can be used in the physiological directions of the joints in the spinal column and the chest wall in flexion, extension, lateral flexion and rotation and in different starting positions (lying face down, sideways, on the back and in a sitting position). Passive mobility exercises consist of general, angular movements and specific translatory movements. In addition to conventional exercises (flexibility exercises for cervical, thoracic and lumbar spine and major muscle groups) and respiratory exercises (pursed-lip breathing, expiratory abdomen augmentation, and synchronisation of thoracic and abdominal movement), aerobic exercises such as swimming and walking are recommended. Research has shown a significant increase in chest expansion following swimming programs and a significant increase in PvO2 and Six Minute Walk Test distances in patients practising swimming and/or walking aerobic exercises. (LOE:3A)Aerobic exercises lead to a bigger chest expansion and therefore a better functional capacity and also decrease the chances of respiratory failure. Spa therapy has shown significant positive short- and long-term effects on pain, stiffness, well-being and functioning of patients with AS. (LOE:1A)However, this treatment is very expensive and since the optimal length of therapy is four weeks, this is unfeasible for many people, especially those who are in the workforce or have families at home. General Exercises See Table 2 below for recommended exercises to include in the exercise program(LOE:1B) 2 Times Per Week Minimum, For 6 Months Increased Functional Capacity, Improved Chest Expansion. Pilates(LOE:1B) Consists of a supervised Pilates session. The difficulty of the movements should be easy to moderate. Difficulty not to exceed 14 on the BORG scale. 1 Hour Sessions, 3 Times Per Week, For 12 Weeks Significant Improvements In Chest Expansion. Inspiratory Muscle Training(LOE:1B) The supervised exercise program, delivered by a qualified physiotherapist, should include; motion and flexibility exercises of the cervical, thoracic, and lumbar spine; stretching of the hamstring muscles, erector spine muscle, and shoulder muscles; control abdominal and diaphragm breathing exercises and chest expansion exercises. In addition to these exercises at home patients should perform six loaded inspirations with a 60 second rest period between each inspiration. This sequence of six exercises continued with 45, 30, 15, 10 and five second rest periods up to 36 loaded inspirations. A rating of more than 17 on the BORG requires the patient to stop exercising. 40 minute session (supervised), Once Per Week, 5 Unsupervised Home Exercise Sessions Per Week Increased Aerobic Capacity, Improved Resting Pulmonary Function and Ventilatory Efficiency. Aerobic Exercise(LOE:5) Research shows that in the short term aerobic exercise has a major effect of all symptoms relating to ankylosing spondylitis. Although there is no bad form of aerobic exercise, studies show that swimming is the best for pulmonary rehabilitation. Studies also show that high impact contact sports should be avoided as this can have a negative impact on symptoms relating to AS 1 hour per day, 5 days per week. (more can be done however should not achieve more than 17 on the BORG Scale Improved Chest Expansion, Improved Functional Capacity and Decreases the Chance of Respiratory Failure. Hydrotherapy is used for many pathology’s relating to back pain. (LOE: 2B) The rationale for the use of hydrotherapy in patients with Ankylosing Spondylitis looks at addressing common symptoms such as stiffness and associated back pain, stooped posture and fatigue. Warm water provides a relaxation effect the the tight musculature around the back. Buoyancy of water allows stretching to feel easier than on land. Reduced pain while stretching/exercising as water provides shock absorption. Easier to stay upright as effect of gravity reduced in water. Spa therapy has shown significant positive short- and long-term effects on pain, stiffness, well-being and functioning of patients with AS. (LOE:5)However, this treatment is very expensive and since the optimal length of therapy is four weeks, this is unfeasible for many people financially. Ankylosing spondyitis is a common chronic inflammatory rheumatic disease with unknow aetiology. Affected joints progressively become stiff and sensitive due to a bone formation at the level of the joint capsule and cartilage. This can lead to structural and functional impairments and a decrease in quality of life. 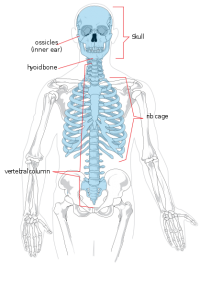 Regions most affected by the disease are the axial skeleton and sacroiliac joints. A combination of medicines (such as non-steroidal anti-inflammatory drugs and biological medications) and physical therapy is recommended. Physiotherapy primarily consists of range of motion and respiratory exercises as well as working on postural corrections. This presentation, created by Kyle Martin, Robby Martin, Haley Metzner, and Stacey Potter; Texas State DPT Class.